The 12th Annual Les Voiles de St. Tropez is scheduled for September 24 through October 2. Sailboat ANNAGINE offers a special land-and-sea regatta race package. It is dubbed the, “Battle in the Bay.” Specifically, ten (10) guests enjoy the race onboard. It is a hands-on experience. You participate in the sailing regatta and race, the Les Voiles de Saint-Tropez. Annagine is €60,000 per week. The package includes multiple items. For example, the yacht, the addition of 4 extra crew members with racing experience, and 5 double rooms in Saint Tropez four-star Hotel Sube. Is a sailboat race on your bucket list? Granted that this is a rare opportunity to both race and relax in gorgeous French city. At any rate, seductive St. Tropez is sizzling this season. For example, the streets and beaches are crowded. This former fishing village has a relaxed “anything goes” attitude. Enjoy! The sailing race is organized by the Societe Nautique of Saint-Tropez. The Les Voiles de Saint-Tropez is an amazing rendezvous of yachts. Almost three thousand sailors will be competing. More than two hundred and fifty (250) sailing boats and traditional yachts will be participating. Classic 33.90 meter sloop ANNAGINE is designed for comfort. Specifically, high performance cruising and state-of-the-art technology. She is also a successful luxury sailing charter boat. The sloop accommodates 6 to 8 guests. They stay in 3 staterooms. The yacht offers cozy entertainment and living areas. For example, these display elegance and style in a comfortable, informal atmosphere. The battle in the bay of Saint-Tropez concludes on October 2nd, with the presentation of the Trophée Rolex – awarded to the regatta’s overall winner of the feature race – The Rolex Cup… With a professional crew onboard, no sailing or racing experience is required. So climb aboard. Enjoy the competition and camaraderie. Likewise, share in the excitement of cruising with hundreds of boats on the bay! 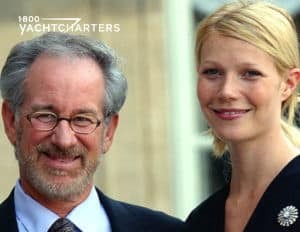 Actress Gwyneth Paltrow joins Steven Spielberg for a day of boating that ends up costing him. The Hollywood Director received a small fine from the Italian Coast Guard, as his yacht came too close to the coast and angered beachgoing sunbathers in Sardinia. 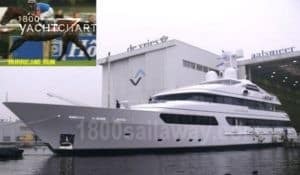 According to the Daily Mail, Spielberg’s 280 foot motor yacht, SEVEN SEAS, breached maritime regulations. Beachgoers were quick to call police and the Coast Guard, who slapped the director of “The Adventures of Tintin: The Secret of the Unicorn“ with a 172 Euro fine. Per Petrella, the “very apologetic” director offered to pay there, on the spot. “I explained it had to be paid via a post office account. He took the paperwork and the next day a fax arrived at our office confirming that the fine had been paid” to the merchant navy. Originally available as a Mediterranean yacht charter vessel, Spielberg yacht Seven Seas has been used exclusively this season by her famous owner, and numerous celebrity guests, like Blake Lively and Leonardo DiCaprio have been spotted onboard. Although Seven Seas is not a green yacht, learn more about carbon neutral yachts in our blog post, Ultra Green Yacht to be First Self-Sufficient Zero Carbon Vessel. Many luxury yacht charter vessels are offering deep discounts to fill their remaining available dates in August. Take advantage of savings of 25% or more this month. Contact 1-800 Yacht Charters at https://www.1800yachtcharters.com/book-now-contact-us/ today! Looking for a last minute European getaway before the kids head back to school? 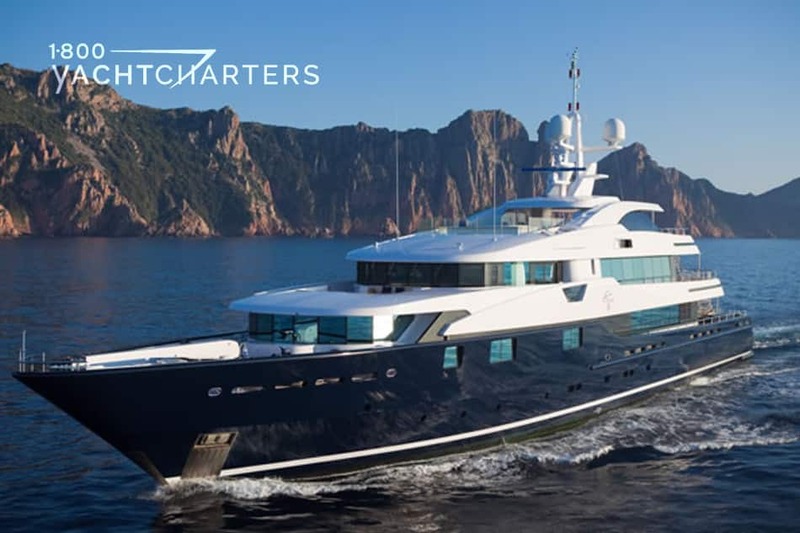 If you are, one of the most popular Mediterranean yacht charter vessels is offering a deep discount to woo your interest. From August 15th, motor yacht CLOUD 9 is offering 14 days for the price of 12 – a savings of over €100,000. To further entice you, the yacht will waive all delivery fees for a cruise in Croatia and/or Greece. Stylish and exceptionally comfortable with 5-star cuisine, CMN line 60 yacht CLOUD 9 boasts a huge Owner’s suite, a VIP stateroom with a balcony, as well as a gymnasium and plenty of watertoys. Oh – we almost forgot, the yacht just installed a brand new waterslide! Join CLOUD 9 in Split – a 20 minute drive from the international airport. Immediate departure for a nearby anchorage to swim and relax. Remain at anchor overnight. Hvar – truly one of the highlights of Croatia. The city has an extraordinary history and a great social atmosphere. The tiny harbor fills quickly with anchored yachts and we must arrive at noon. We’ll dinghy our guests ashore where they will find vineyards, lavender fields, walks and clean beaches. For the evening, Hvar offers great cafes and restaurants – and the best in Croatian wine. The bars and cafes remain open late into the night. Depart Hvar for a passage to Korcula, the home of Marco Polo. Once at anchor, the protected bay is the perfect place for a day of watersports and swimming. After dinner, we’ll dinghy ashore to walk the ancient streets to window shop and listen to the street musicians. An early morning passage brings us to the Mljet National park, a peaceful, and beautiful anchorage. Here, we’ll find steep, rocky slopes covered with dense pine forests that hide a 12th century monastery built on a small island in the middle of a lake. That’s right, an island on an island! The lake is generally 4 degrees warmer than the sea, and a good place to swim. Hiking, guided tours and bike rentals are also available. All that in the first 4 days – imagine what adventures might be in store for the next 10 days???! Would you like to charter this gorgeous lady? 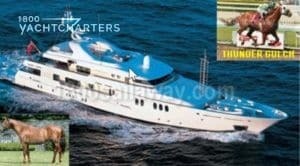 Contact 1-800 Yacht Charters at https://www.1800yachtcharters.com/book-now-contact-us/ right away! Destination Caribbean – Where is St Thomas? For many years, St. Thomas has been the gateway to the Caribbean, and the embarkation port for thousands of Caribbean yacht charter odysseys. 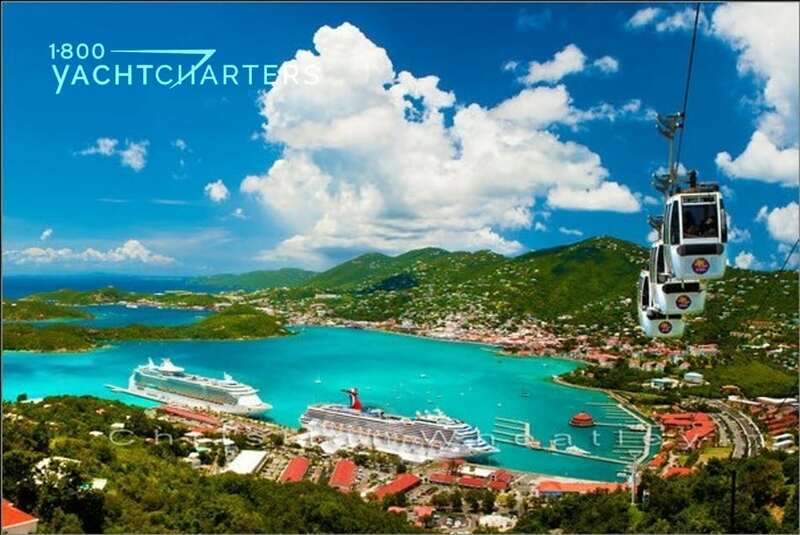 With a major international airport and a large, protected bay in the capital city, Charlotte Amalie, St Thomas is a boater’s paradise. St Thomas is one of three main islands that comprise the United States Virgin Islands (USVI). 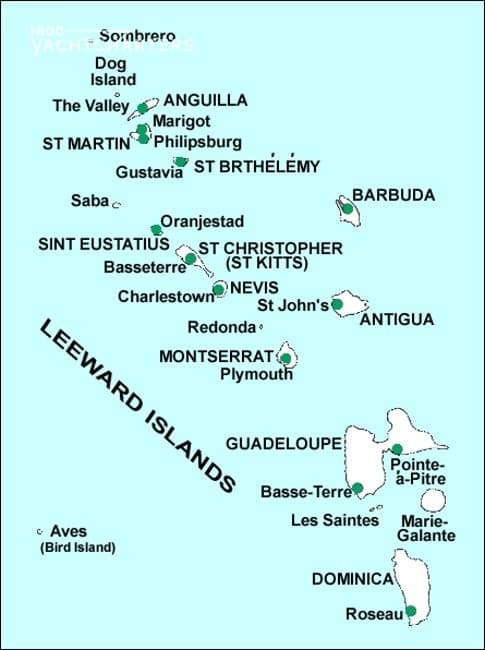 The other two islands are St John and St Croix. Located in the area of the Caribbean known as the West Indies, St Thomas is 1100 miles southeast of Miami, Florida, USA, and just 35 miles to the east of the island of Puerto Rico. Average flight time from Miami to St Thomas is 2 hours and 50 minutes, and from San Juan, Puerto Rico to St Thomas is 30 minutes. Once onboard a luxury sailing charter vessel in St Thomas, the sailing time to the nearby British Virgin Islands is approximately 2 hours. Motoryachts can make the trip in less than 1 hour. Click HERE for a selection of the newest yachts available for a St Thomas yacht charter vacation. Destination Caribbean: Where is Grand Bahama? Recently, a customer asked, “Where is St Thomas?” We answered the question in our blog, entitled, “Destination Caribbean: Where is St. Thomas?.” Here, we identify the location of another popular destination. We introduce one of the most family-friendly islands in the Bahamas, GRAND BAHAMA ISLAND. Grand Bahama Island is located in the Caribbean, in the Atlantic Ocean. 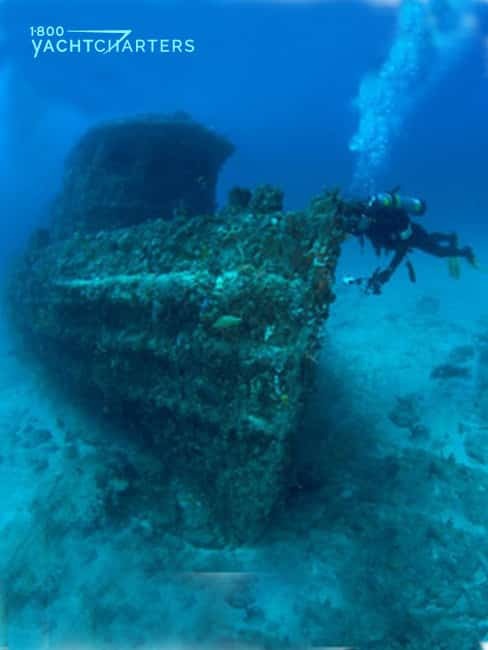 It is about 190 miles west of Nassau and 55 miles from South Florida. It is also due east of Fort Lauderdale and northeast of Cuba. Atlas and map users users will find the island at coordinates 26°39?N 78°19?W. Grand Bahama is the fifth largest island in the Bahamas island chain. 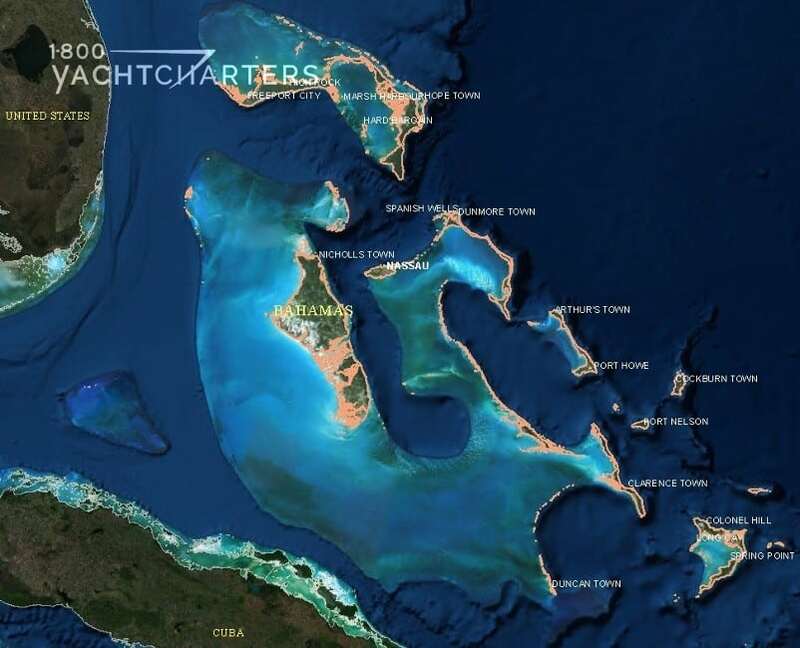 The chain has approximately 700 islands and more than 2,000 cays. It is in the Eastern Standard Time zone (EST). Daylight Savings Time (DST) is observed in the summer months from March to November. This is when the time is pushed forward by 1 hour to Eastern Daylight-savings Time (EDT). It shifts back by 1 hour after the summer, and returns to EST. WHICH AIRPORT TO FLY INTO? By air, the island’s international airport, Grand Bahama International Airport (GBIA), is 35 minutes from Miami. It is 3 hours from New York. It is also 7 hours from Los Angeles. Finally, it is 9 hours across the pond, from London. The charms of the island attract visitors from around the world. Many of these visitors arrive on the largest yacht charter vessels. 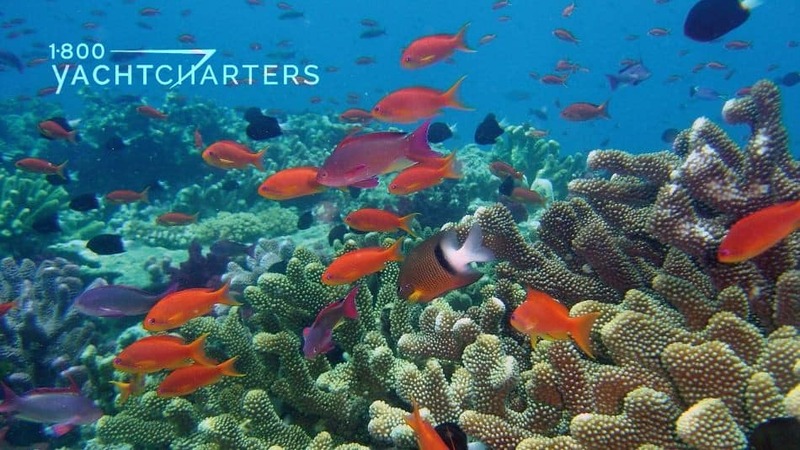 Deep surrounding waters and bordering shallow reefs teeming with tropical fish are an irresistible magnet. It keeps boaters coming back year after year. The islands premier marina is the full-service 115-slip Port Lucaya Marina. Grand Bahama features lots of excitement. For instance, miles of beautiful beaches, nature preserves, resort hotels, a major casino, nighttime entertainment, an animal shelter full of the Bahamas’ own breed of dog available for adoption (the potcake). It also features warm, tropical, emerald-green seas, and tons of watersports activities. A NEAT FACT: When Christopher Columbus visited the island in 1492, he called it Gran Bajamar – ‘Great Shallows,‘ from which the name Grand Bahama was derived; however, the name of the island’s capital city, Freeport / Lucaya, is probably better known to the world today than the name of the island, itself. Horse racing. For centuries it has been known as, “The Sport of Kings.” An obsession which borders on an addiction. To illustrate, she is a mixture of both royalty and aristocracy. Modern day royal families and billionaire capitalists keep alive this grand tradition. They own and race horses. 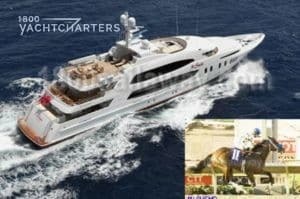 In addition, some horse owners also own luxury yachts. Specifically, a few have chosen to name their yachts in honor of their prized steeds. Below are 3 extraordinary equine athletes and their namesake yachts. Thoroughbred Thunder Gulch left the starting gate at 25-1 odds in 1995. He went on to win the Kentucky Derby. Born in 1992, the champion American racehorse was ridden by Hall of Fame jockey, Gary Stevens. He was trained by legendary horseman, D. Wayne Lukas. Thunder Gulch then won the 1995 Belmont Stakes, the Florida Derby, and more. On the other hand, motor yacht Thunder Gulch was “born” in 1999. The 164′ Mediterranean yacht charter vessel accommodates 10 guests in 5 staterooms. Recently sold and renamed TJ ESPERANZA, ex-Thunder Gulch is available for charter at $250,000 plus running expenses per week. 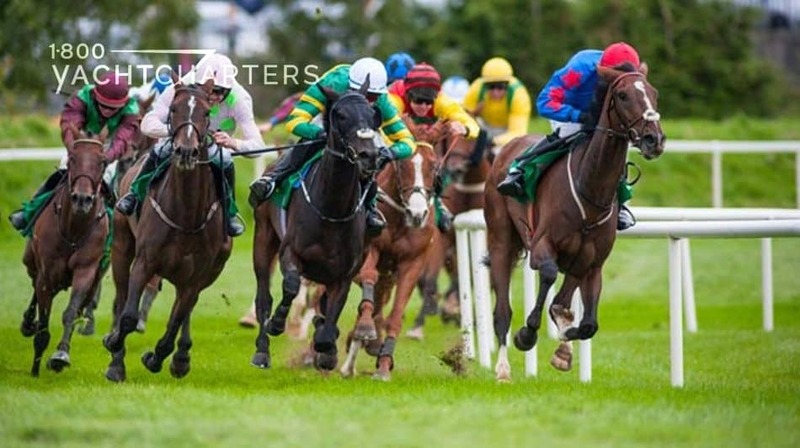 Irish horse Hurricane Run launched an illustrious career with wins at the 2005 Prix de l’Arc de Triomphe Lucien Barriere, and the Irish Derby. He was named the European Horse Of The Year at the 2005 Cartier Racing Awards. In the same way, motor yacht Hurricane Run was launched in late January 2009. She was born at Feadship Koninklijke De Vries Scheepsbouw yard in the Netherlands, The 53.50 meter megayacht accommodates up to 12 guests in six cabins. Rental rates start at $315,000 per week, plus expenses. Leading US filly Mi Sueno saw her promising career cut short by a condylar fracture of her off-fore cannonbone in 2009. She won the Grade 1 Darley Debutante at Del Mar. Mi Sueno was retired as a broodmare by trainer Eric Guillot. The daughter of Pulpit also won the Grade 3 Sorrento Stakes at Del Mar. After that, she beat Grade 1 winner Blind Luck in the Debutante. Consequently, 190 foot motoryacht Mi Sueno, launched in 2010, is was a standout. She has WiFi and Kaleidescape central movie/music server throughout. She is also equipped with a 2-person, wheelchair-accessible elevator. When it comes to the ultimate vacation, stop horsing around. Rent a private yacht with professional crew, watertoys, and endless amenities. 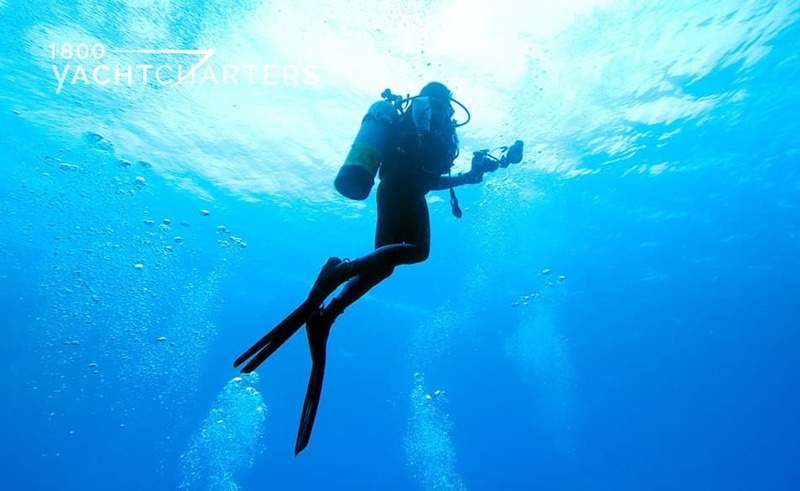 Contact our destination specialists at https://www.1800yachtcharters.com/book-now-contact-us/ today. We first brought 2011 motor yacht HURRICANE RUN to our readers’ attention as a yacht named after a famous race horse. 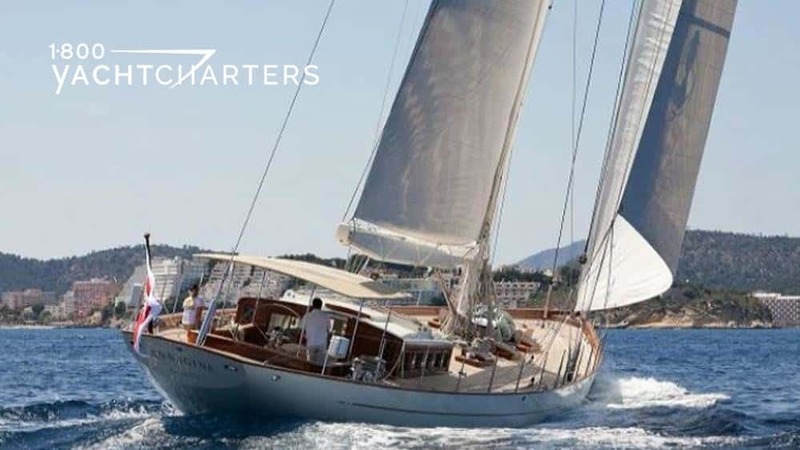 Now, the owner of this 54 meter Feadship yacht charter vessel wants to encourage you to race forward and claim a $55,000 discount on a Caribbean yachting holiday this winter (between December 1, 2011 and April 30, 2012)! On behalf of the owner of megayacht HURRICANE RUN, we are pleased to extend a special offer of $295,000 per week for the next two charters booked in the Caribbean. This represents a savings of $55,000 from the regular winter season rate of $350,000. WHERE IS THE YACHT LOCATED? 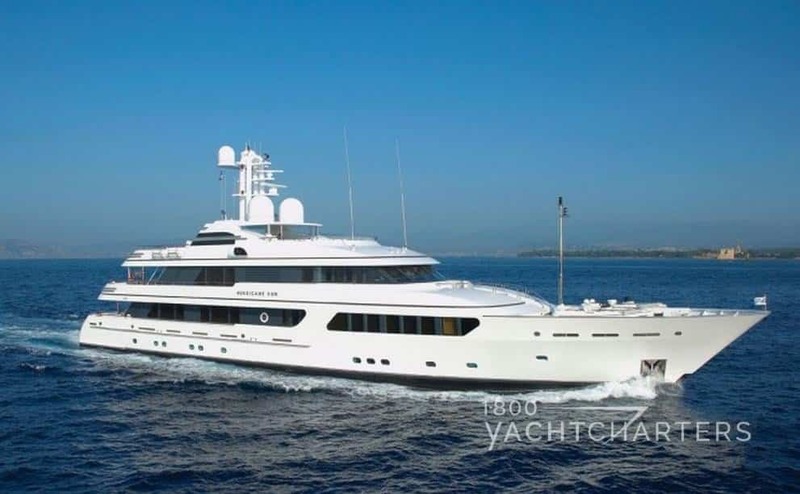 Currently booked December 21 to 29, 2011, Feadship yacht HURRICANE RUN can be available for a New Year’s celebratory charter starting December 31st, 2011, in St. Maarten. The offer only extends to the first two reservations (click here to book Hurricane Run!) so hurry and take advantage of this exceptional rate and spend a week with your family and friends on this extraordinary yacht! Looking for a great price on a last-minute summer getaway in the Mediterranean? Click HERE for discounted offers in August and September, 2011. A dozen or so Mediterranean yacht charter vessels prepare. It is time for the regatta in Sardinia. At the same time, another race is canceled abruptly due to the threat of a hurricane. Nevertheless, preparations in Costa Smeralda, Sardinia continue. 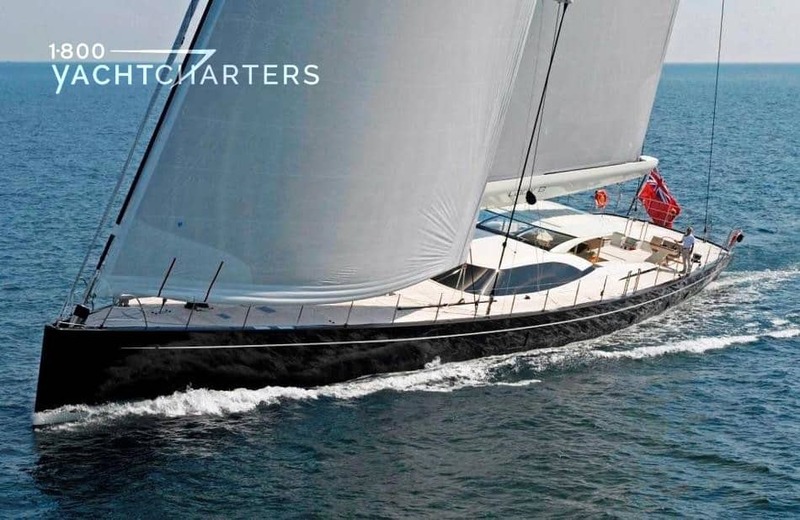 A fleet of Perini Navi yachts are poised to compete in the Perini Navi Cup. During this time, race organizers of the 25th annual Newport Bucket Regatta are busy. The race is August 25 – 28, 2011, and Hurricane Irene had other ideas. As a result, they called off Saturday’s main event as Hurricane Irene arrived. The actual race was cancelled. The unfettered spirit and camaraderie shone on. Equally important, the big post race party, known as “The Bash,” is a go. It shifted by one night, from Saturday, to Friday. On Wednesday, the yacht captains in the Newport Bucket Regatta had a meeting. Specifically, Peter Craig and bucket director Hank Halsted were there Consensus determined that Hurricane Irene’s threat made race cancellation the only choice. Transitioning from race mode to storm mode for a superyacht is extremely time-consuming. The decision was finally made to safeguard the yachts and their crews. In spite of preparing for the storm, some owners and their families and guests are ready. They plan to enjoy the gala Bucket Bash at the Newport Shipyard. The Bash will feature all the food and festivities planned for the special 25th Anniversary Celebration. In like fashion, the Texas Legends Airshow, was also canceled. It was held in conjunction with the Bucket and sponsored each year by the owner of the yacht, Tenacious. All eyes look ahead to the 2012 Newport Bucket Regatta! Chartering a sailboat for the a regatta is a unique experience. It is filled with excitement and fun. There are dozens of friendly regattas around the world. Contact 1-800 Yacht Charters HERE for more regatta information. The Olympics. The pomp. The circumstance. A graduation of sorts. Once again, we are glued to our televisions. Fifteen thousands (15,000) talented Chinese performers on the field of the “Bird’s Nest.” China kicked off the Opening Ceremony for the 2008 Olympic games. Amazing. Here we are again. 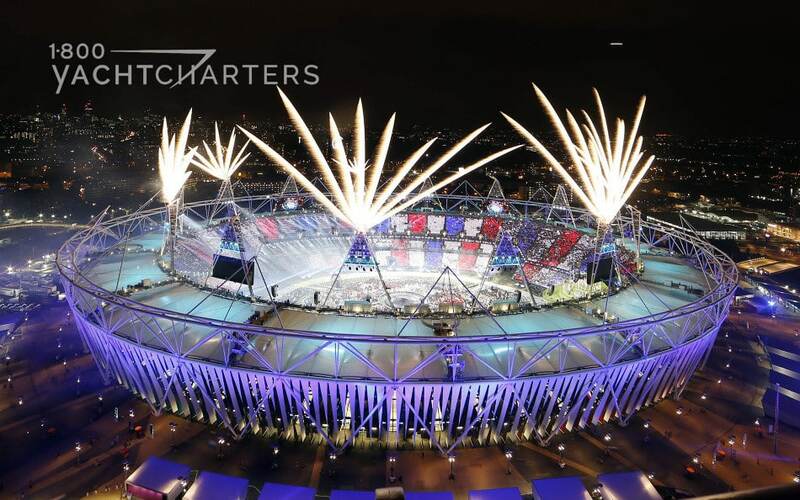 One year before the opening ceremony of the London 2012 Olympic games. Meanwhile, the notion of renting a yacht for the London games is considered. In other words, marina reservations are well under way. 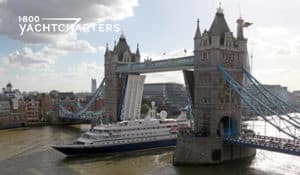 Additional berths have been added to accommodate the expected visitors arriving by superyacht. “One thing is certain.” says Jana Sheeder, President of 1-800 Yacht Charters and SailAway Yacht Charter Consultants. Rent a private yacht through 1-800 Yacht Charters. Enjoy complete Olympic concierge service. For instance, secured dockage, ground transportation to the various athletic venues, and secured event tickets. Contact our destination specialists HERE today.